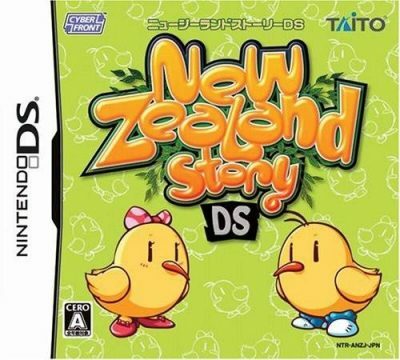 In 2007, almost 20 years after the original coin-op, Marvelous Entertainment developed for Nintendo DS a sort of remake (more like a remixed version) of the game titled New Zealand Story Revolution that takes advantage of the dual screen feature. Except, not really, because the innovations are mostly gimmicky and don’t really expand upon the possibilities of the game. For starters, the second screen is usually reserved for the map, but it remains barebones like in the original arcade, being a blank screen with dots for Tiki, the exit and the key. Yes, there are keys now. The developers decided that this time reaching the cage wasn’t enough so you have first to look for the key to open it, leading to much annoying backtracking. To add insult to injury, sometimes you can warp to a different part of the stage without the key and, since you can’t go back, the only way to finish the stage is to commit suicide and restart. There are also some minigames that require the use of the stylus. They are very simple stuff, like spotting the difference between two pictures, catching fish, helping Tiki cross a tightrope or opening the doors by rotating their handles. The problem is, they not only appear abruptly, but in some cases the action on the upper screen is notstopped, meaning that you have to pay attention to the minigame but also to the platforming section. 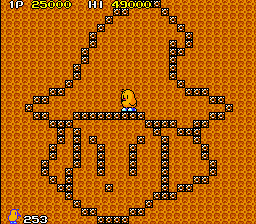 This is already difficult on its own because, like in the arcade original, enemies come in swarms and rapidly home on Tiki. So the whole stylus gimmick comes off as unnecessary and tacked-on. Luckily not all the minigames are actually needed to progress in the game, some are just for getting bonuses and finding secret areas. There are other improvements though. You can take three hits instead of one. You can also adjust the aim of the bow – which is only useful for boss fights – by pressing the R button and the direction pad. You can double jump, dash, and given limited flying abilities. There are charged shots, new weapons like fire and ice arrows and a lance and shield combo, plus a handful of new vehicles like anti-gravity roller skates and a car that only goes back and forth but can destroy almost everything on its path. Although, why they added such a vehicle in a game where stages expand almost always vertically is anyone’s guess. This is a good example of the design approach of the developers. They tossed in many things without thinking if they gel with the general tone and structure of the game, and we have a “remake/sequel” that has many problems but still does not fix the ones that the original title had. Plus, there are infinite continues and the opportunity to continue from the last stage you reached:. The Heaven rounds are still there, but even if you fail them, you have the possibility to continue right where you died, so what’s the point? 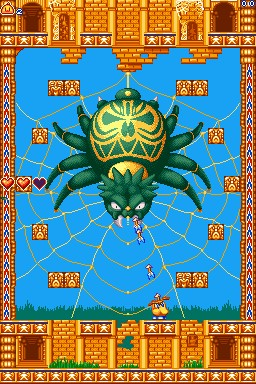 There is also a brand-new boss, a giant spider, but it is nothing to write home about. Speaking of bosses, this time the boss battles are not quick affairs but are modified to take advantage of the double screens, in some cases becoming overly complicated. 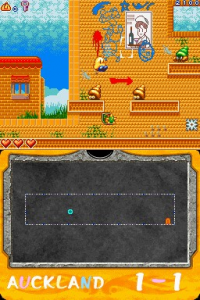 One example is the battle against the missile-shooting robot doll which never leaves the screen below and you must hit by shooting your arrows at colored portals that change over time. To be fair, there is one area where Revolution improves on the predecessor. The graphics are crisp and faithful to the original style, and the sprites are more detailed, now with shaded colors and a little rounder/chubbier appearance, much like the evolution of the style in the Bubble Bobble games. There’s also an added parallax level in some stages and a few amusing details, such as the stomach of the frozen whale that is now full of random junk, including a car. The music is the same theme of the original, but arranged in a different way for every level, with more tribal or ominous sounds in certain cases. Despite this, it becomes annoying quickly just like its 1988 counterpart. Other incidental music was similarly re-arranged. 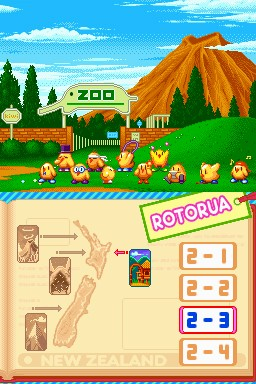 New Zealand Story Revolution does not revolutionize anything and all the changes come to the detriment of the game instead of improving it. Still, it’s better than other abysmal NDS remakes of Taito properties like Bubble Bobble or Rainbow Islands, but that’s not saying much. 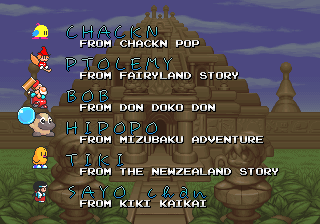 Taito had the habit of putting references to its past games in other titles, at least since Bubble Bobble, and Tiki is no exception. 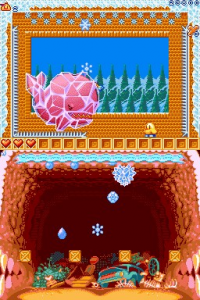 The first cameo is probably the one in Liquid Kids / Mizubaku Daibouken (1990, here seen in the PC Engine version) where a secret area has blocks forming the shape of the little bird, much like some warp rooms in TNZS itself had outlines of Ptolemy from The Fairyland Story and of a Puka Puka ghost from Kiki Kaikai. Tiki pays homage to his platformer predecessors. 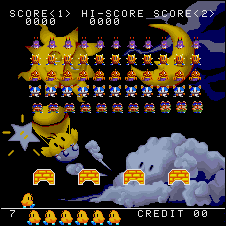 The arcade game Space Invaders DX (1993) is a collection of different versions of the famous title, which also included a “Parody Mode”, which is a rehashing of the usual Invaders gameplay that switches graphic elements with characters of various Taito titles. 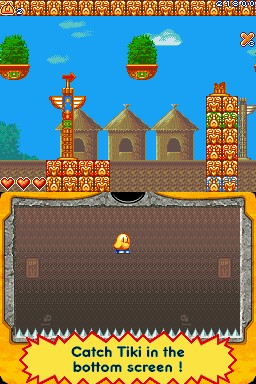 The first parody level is based on TNZS with Tiki as the cannon and disproportionate enemy sprites as the aliens. It should be noted that the background image is not based on a particular level but is directly inspired by the arcade flyer illustration. 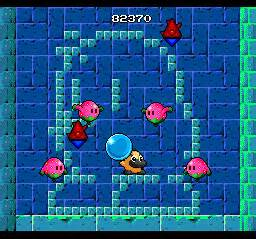 Bubble Symphony (1994), the arcade sequel to Bubble Bobble, has a huge collection of Taito references, including some that actively help the players. By picking up certain objects, Bub and Bob can summon heroes of past Taito games, who can turn enemies into bonus objects. 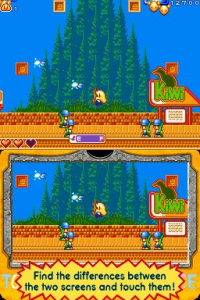 Tiki is among them, and eliminates the bad guys with his arrows. 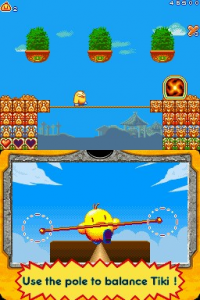 Finally, in 1997, almost 10 years after the original arcade game, Tiki can be controlled again by players, even if only indirectly, in the context of a puzzle game. 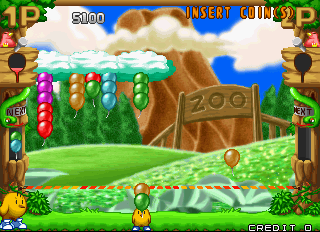 Pop ‘n Pop is a title that can be described as “Puzzle Bobble meets Space Invaders” where you have to match and pop colored balloons, starring cute characters from past Taito titles like human Bub and Bob, the dwarves from Don Doko Don, Sayo-chan from Kiki Kaikai and Tiki with Phee-Phee, whose stage in Puzzle mode is once again Auckland Zoo. Tiki’s special weapon is of course based on his arrows, and when he makes some combos he is surrounded by his fellow kiwis. 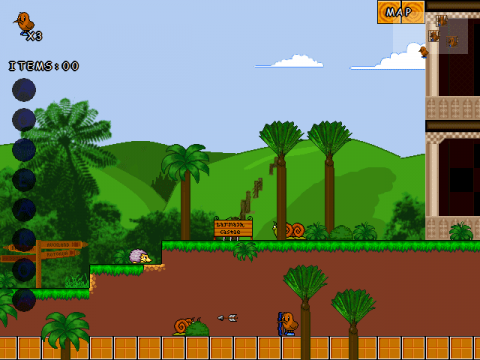 There exists also a fangame, a sort of remake called The Kiwi’s Tale, developed for the Retro Remakes 2008 competition for Windows and Mac, now also available as a browser game in HTML5. The gameplay and plot is largely the same, but all in all the game is slightly more rooted in reality. 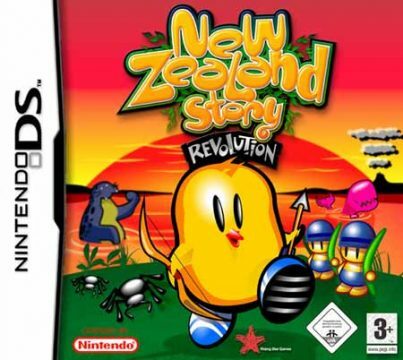 The protagonist, Nik, is a little more reminiscent of a real kiwi, many more real locations are mentioned, there are cultural references such as Tui billboards, enemies include real-life native species like sheep (with rocket launchers! ), sharks and hedgehogs, and when defeated they drop things like rugby balls, flip-flops and Peter Jackson’s Academy awards. Gaming Hell Source of informations and pictures about Space Invaders DX. 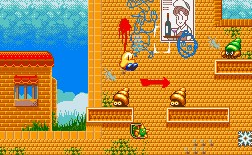 Earok’s Arcade Play The Kiwi’s Tale in your browser.